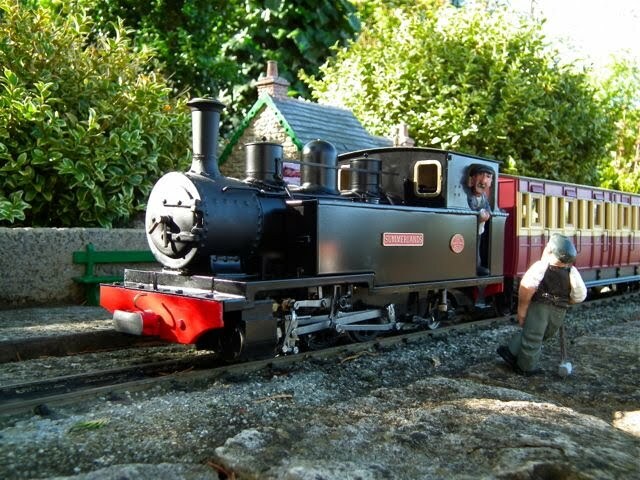 This Roundhouse Argyll was built in 2003 (they ceased production in 2004) and came as a second-hand, very low mileage loco, with 40 mhz radio control. Before running it I replaced the receiver on the loco with a budget 2.4 ghz one - which took about five minutes. This loco had been a "shelf queen" for most of its life, so the high gloss Roundhouse finish had been enhanced by much careful polishing. As this is a late model. the smoke-box is attached by two screws from underneath and as these were accessible, the smoke-box was off in a couple of minutes. 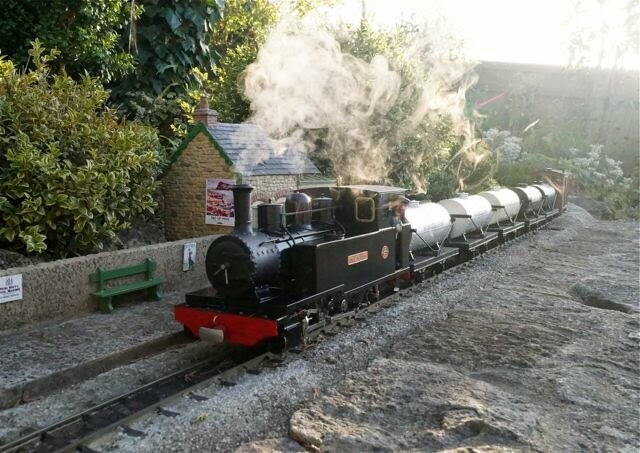 A Summerlands Chuffer was fitted in the normal way and the smoke-box was degreased, rubbed down lightly with an abrasive fleece and sprayed matt black (Halfords acrylic). 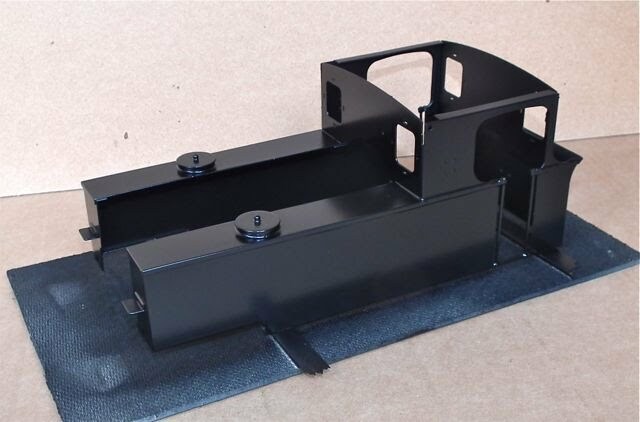 The contrast with the front footplate was now too great - and as these can be unscrewed, they were removed and sprayed Satin black (Halfords Acrylic). The area under the smoke-box door was brush painted the same (though it looks more matt in the photo below). At the same time, engraved nameplates from Alan Briggs were fitted using clear silicone as an adhesive. 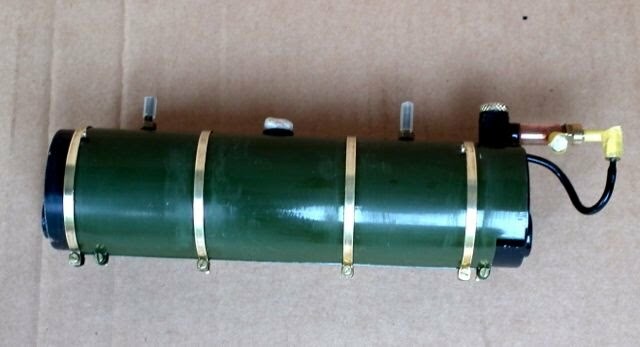 Also the buffer beam screws were replaced with small headed 6 BA bolts (the head is 7 BA). Here is a video of her in action on a Winter's day. Well here is the first side with transfers - not the easiest task, but quicker than sending it off for paint lining (or trying to do it myself). All the lining is now on - and I put a number on the cab side too. It is not No 3 - but hey, whose counting! I found those brass steam pipes a bit shiny, so dipped them in Carr's Brass Black for about a minute and then dried them in front of the fan heater (without rinsing). This gave a pretty tough finish that could be buffed with a cloth. Well it is now a few months since I blacked the pipes and the I have to say that the finish is not as durable as I hoped as the pipes are now rather mottled. So it isprobably better to etch and paint. The Locolines transfers suffered a bit too - I have found various parts lifting, though I managed to stick them back with dilute PVA. On reflection, I think it would have been better to add PVA to the water used for the transfers. After these videos, the loco mostly sat on the shelf for a couple of years. The lining began to peel off as I had no sealed it with varnish (in case I wanted to give the loco a re-spray). So eventually I peeled them off and cleaned up the tanks with a little car polish. There were a couple of nicks on the paint, so i touched these in with the matching enamel from Loocoworks and then it was back on the shelf. I was looking for a little project, one rainy September day in 2012. I stared at the Argyll and decided that I really didn't like the colour. Gamboge looks fine with a full blown lining job in the C&M colours, but I knew I wasn't going to do that. And I had always rather fancied repainting it in black, using Halfords Satin acrylic which stands up to heat pretty well. I took the body off (loosen two screws in front of the tanks and remove one at the back) and stared at the challenge of the pipework. Like the Fowler, the only way to remove the boiler involved bending the stainless super-heater pipe so it would pass through the boiler. I have done it a couple of times on Fowlers but was there an easier way? Could I remove the smokebox and then the boiler bands and ease the wrapper off forwards, leaving the boiler in situ? The simple answer was NO! So I thought "What the heck" and started dismantling. The gas tank is held by one screw and nut, and when the gland nut is undone from the jet holder, the tank lifts clear. There are two gland nuts to remove the lubricator and then one screw underneat, through a frame spacer, holds the burner mount in position. This is, in turn, held on to the boiler by a boiler band. I removed the burner from the mount (two screws) and then tackled the superheater tube. I used a tight fitting spanner on the fixed nut, and used an adjustable spanner on this to twist it gently, just enough so that it would pass through the flue. You can see the method here (this was on re-assembly, but it is the same technique). The dome lifts off the boiler, but the sand boxes need to be unscrewed. First remove the "actuating rod" by unscrewing the two self tappers. Then unscrew the brass sand boxes drom the captive bolts fixed to the boiler wrapper. The white metal bases with pipes can then be lifted off. With the boiler off, I was faced with a dilemma. Should I remove the bands and the wrapper and paint them all separately, or paint it as a whole. The deciding factor for me was that I wanted the bands the same colour as the boiler, and therefore I could get a better result painting it as one. I rubbed down the brass and the the paint with 600 grade wet and dry and also rubbed down the bronze regulator. Then I masked the threads and used BlueTac to block the safety valve hole etc. I degreased twice using white spirit. I then stood this on a block of wood for spraying, and warmed/dried it in front of a fan heater. Then I gave it a light coat of Upol acid etch 8 and put it in the oven at 100 degrees for 20 minutes. The etch primer is really only for the bare brass. As I was a bit short of Satin Black, I gave the boiler three coats of matt black and then a top coat of satin. I baked this at 100 degrees for 20 mins and then a further 15 mins at 140 degrees. The first task on the bodywork was to find the places I had touched in with enamel. This would react with the Acrylic paint and so I removed it with white spirit and some hard rubbing. The works plates then had to come off. I boiled some water in a frying pan and immersed the plate in it. The first one came off with a sharp tap from a piece of wood. The second one was more stubborn, but just a slight flex of the platework behind it and the plate popped off. After that, I eased up the tabs on the spectacle plates and removed them. Then it was a case of a light rubbing down and degreasing with white spirit before four coats of black, each one being flashed off in front of the fan heater before the next. I then baked the body for 20 mins at about 80 degrees. The boxes themselves just need a light keying and can then be degreased and sprayed. The bases were truly awful white metal castings and needed some cleaning up. I used a sharp scalpel and chisel to remove the unwanted metal so that they made some sort of sense. They were then primed before painting. I thought for a while about the nice brass dome, but then decided it had to be black. It was etch primed, baked, painted and baked again. The dummey pipes were primes and then sprayed matt black. When dry, the fronts were maskes and the part over the boiler was sprayed satin. They are rather awkward to re-fit, so I eased the mounting loops and carefully pushed them in at an angle until nearly home. Then I turned and sprung the front part into position on the smokebox. I wanted the upper half of the cab interior cream and this was to be done with Humbrol Matt enamel. Here I hade a big mistake - I was going to oven the Humbrol, but I still used masking tape. OK it was the expensive Tamiya tape, but I should have guessed that new paint, high temperatures and masking tape do not mix. I did get my three coats on and dry in 2 hours, but when I removed the tape, there was the imprint. Bother - I said! There are no photos I am afraid. I rupped down the cab front and back plates with very worn 800 wet and dry used wet. I then cut masking to a smaller size than the spectacle plates and masked the holes. I then stuffer the cab with kitchen towel and masked over the top before re-spraying. it worked!